Thanks to our partners at DriveThruRPG, we’re currently running a V20 Summer Bundle. Save 80%! If you’ve always wanted to get into Vampire: The Masquerade’s 20th Anniversary Edition, now’s your chance! 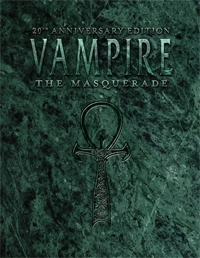 You can get the PDF of Vampire: The Masquerade 20th Anniversary Edition by itself for a mere $5.99! Or: get V20 in conjunction with the V20 Companion; Children of the Revolution; Dread Names, Red List; and Dust to Dust — an $80 value — for only $14.99! Our friends at White Wolf are also currently running a Vampire: The Masquerade Humble Bundle featuring classic products from VTM’s Revised Edition, providing up to $223 of PDFs, with all rewards unlocked at $33 of contributions. So between the two bundles, for under $50 you can get more than $300 worth of Vampire PDFs! ◀ Now Available: New Chronicles Merch! So how long is that bundle running anyway? Surely it’s not just for Christmas in July — that’s about to end, after all.